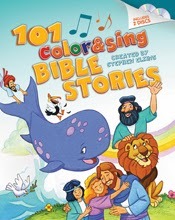 101 Color & Sing Bible Stories combines reading, coloring, and singing to introduce young children to the Bible. I think in is an ingenious way to present the stories of the Bible to children in a way that engages them and appeals to many different learning styles: visual, kinesthetic, and auditory learners are all given a medium. The resources for this book include two CDs containing songs that accompany the Bible stories in the book, along with a printable coloring page for each story. A guide note is included on each story page showing parents with coloring page to print out, which disc it can be found on, and a "Fun Fact" to share with kids. The songs are simple, with children's voices and an upbeat, modern tempo. The lyrics are repetitive so that even very young children can catch on quickly and join in singing. I find the CDs to be a bit glitchy on my computer, however, and had a few issues figuring out how to pull up the coloring pages. I might be doing something wrong, but I am also finding it difficult to start and stop the songs as I choose and not have them play on auto. Otherwise, I think 101 Color & Sing Bible Stories is a fun way to teach children God's Word in a manner that will generate enthusiasm. Each story, accompanied by a Scripture reference, is very short (only about a paragraph in length), and features a full page image of cartoonish animated figures and scenes illustrated in and colors. The padded hardback book is visually appealing, and as a bonus, a black line printable drawing is available for each illustration in the book. The stories start with creation and include both New and Old Testament content. All in all, this book is an excellent way to engage very young children, and I think it is most appropriate for preschool ages.